I cannot speak for all my furry friends out there, but I love the cold! There is nothing better than a cold wind blowing on my face. Well, at least if it isn’t like -10 out there, I mean I have my limits too. What I mean to say is, your pets get cold just like you do, and shouldn’t be outside for extended times when the temperatures drop below freezing. We have fur, but it can’t keep us warm in severe temperatures. So, you have permission to dress us up in cute coats; though we hate to admit it, we need those too. For any furry friends that live outside, please make sure they have a wind proof dog house to shelter them from the bitter cold. 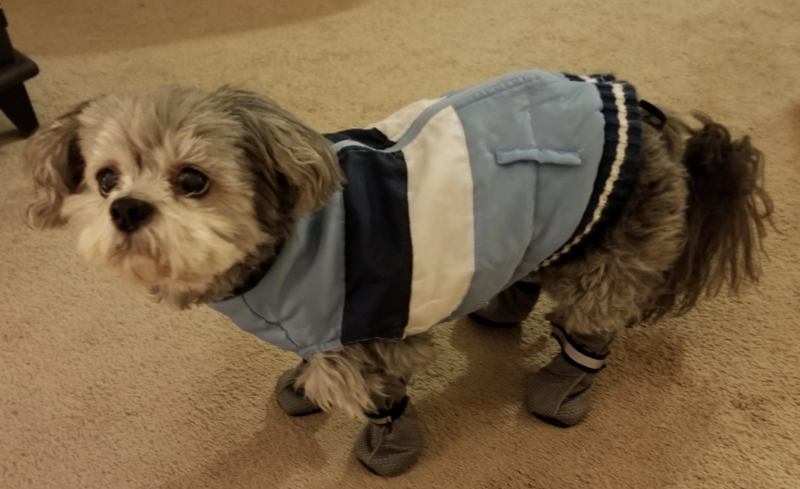 When the temperature drops to 27 degrees during the day and 10 degrees at night, bring your pets into a garage or shelter with a higher temperature. Their food dishes should be plastic, and water checked regularly to make sure it didn’t freeze. And since staying warm takes energy, they will need slightly more food during the colder months. One more thing, watch out for the salt and other chemicals used to melt the ice. It can irritate our paws and if we lick it, it could make us sick. So, be sure to wipe your pet’s paws when coming in from outside. And from personal experience, I know there are boots out there you can put on us to protect our paws too. My mom just laughed at me when I first got mine, but the joke was on her to have to put them on me all time. For any other winter weather tips, be sure to go to libertyvet.net. And from all of us here at LVH, have a safe and happy holiday! Next week, crossword fun with winter tips.